ping things is very happy to be associated with THE AMBiENT PiNG, Toronto's premier weekly live ambient, chillout and experimental music performance event. "Subterranean Landscapes" is on sale for only $13.00CAN plus $3 shipping anywhere in the world! 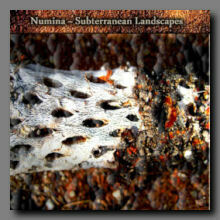 Numina's latest release, an impressive return to the ambient scene. One of the biggest musical highlights for me in 2011 was the welcome return of Jesse Sola's project Numina. Following are a few capsule thoughts I have on the individual tracks from his album "Subterranean Landscapes". "Subterranean Landscapes" opens with "Scraping the Surface", a deep thick piece of music where expansive drones ebb and flow, resulting in a very impressive creation of space and atmosphere. "A Deep Sense" follows, a thick wash of bells and metallic ringing, a haunting piece that brings to mind dark caves at night. Pads wash across the proceedings, adding a little bit of depth and a touch of colour to the sound of the track. "Fluid Red" is like a night time journey through a rain forest in the heart of the rainy season. Tones rise and fall, and a wash of sounds play throughout. Probably my favorite piece on the disc. Very nice work. "The Dark Air" has rich and strong tones that ring out, sweeping across the soundspace. Nicely produced and nicely arranged. "In the Molten Murk" pairs a cold metal feeling with deep sweeping pads to create a ringing and beautiful cavern of lost souls. Nicely played Mr Sola. "Underneath the Silent Storm" has a delicate sensibility underneath it, a still life painted using musical forms. Of particular note are some strange springy sounds that move back and forth through the soundscape, resulting in a beautiful sense of movement and grace in the piece. "Resurrection of the Stone Giant" closes the disc, leaving the listener with a beautiful summation of everything that's gone before, and a suggestion of work to follow. A lovely way to end the album. I'm quite impressed by "Subterranean Landscapes" and I totally recommend it as an excellent starting point for those of you that aren't already familiar with Jesse's work as Numina, as well as an excellent addition to the collections of those of you who, like me, are already big fans. Be sure to stop by tomorrow for my thoughts on "Dawn of Obscurity" by Numina!